It should not be because of child’s wish that the family gets a German Shepherd! But having said that, it must also be said that it can be very rewarding for children to grow up with a dog. 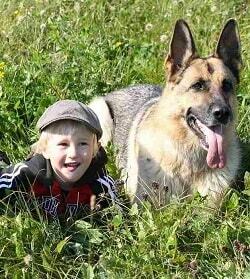 In fact, German Shepherds and children can both benefit from the relationship. They can learn to associate with other living beings with reason, respect and care. But never expect that a child can be held responsible for an animal – nor a dog. When choosing to get a dog – it is solely an adult’s responsibility. Dogs is often referred to as “child-friendly”. That is a true fact, if they are acclimated and have good experiences with children from puppy stage. For the dog to be happy and comfortable with both foreign children and adults, it is important that they be exposed and socialized as a puppy. When you get a dog at home, it is important that both children and dog learns some basic rules about what you can and what you cannot do. Furthermore, one should never let small children and dogs be alone together. If you have a good set of rules for handling the dog, there is high probability that the outcome will be positive. The rules must be in place before the dog arrives at home. German Shepherd Temperament: What’s It Generally Like? I am looking for a child friendly dog to add to the family. I have heard great things about German Shepherds. It sounds like they are easy to train and are great with kids, I would love a dog like this.